The Soyuz TMA-04M rocket launches from the Baikonur Cosmodrome in Kazakhstan on Tuesday, May 15, 2012 carrying Expedition 31 Soyuz Commander Gennady Padalka, NASA Flight Engineer Joseph Acaba and Flight Engineer Sergei Revin to the International Space Station. Famed soprano singer Sarah Brightman will make a 'groundbreaking announcement' about space travel next month, according to the U.S. space tourism company Space Adventures. Brightman will hold a press conference in Moscow Oct. 10 at 4:00 p.m. Moscow time (8:00 a.m. EDT). She will appear with UNESCO Artist for Peace Mikhail Gendelev and Eric Anderson, chairman of the Virginia-based firm Space Adventures. Space Adventures has brokered deals to send seven private citizens aboard Russian spacecraft to the International Space Station. These space tourists typically train extensively in Russia before their trips, and spend about two weeks in Earth orbit. Their ticket prices have ranged from about $20 million for the first traveler, American investor Dennis Tito, in 2001, to $35 million for the most recent space tourist, Canadian circus-founder Guy Laliberte, in 2009. There is no word yet on whether Brightman herself will become the next private space traveler, or if her collaboration with Space Adventures involves some other project altogether. 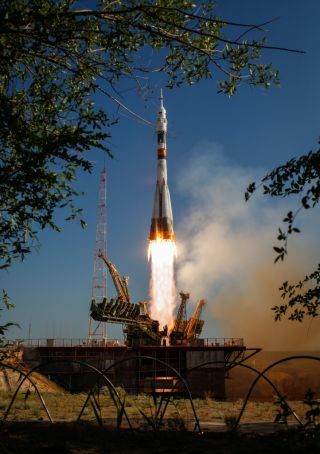 Available seats on Russian Soyuz spacecraft have been scarce lately, as that vehicle is the only transportation for astronauts to the space station in the wake of last year's retirement of NASA's space shuttles. However, a source within the Russian space agency told state news agency Interfax that seats may open up to space tourists on flights in 2015 when professional astronauts and cosmonauts start serving year-long tours of duty aboard the station. Brightman, a native of England, is "the world's biggest selling soprano," according to Space Adventures, and sings with a vocal range spanning three octaves. She has topped both the Billboard dance and classical music charts, and performs around the world. "Sarah's work transcends any specific musical genre, synthesizing many influences and inspirations into a unique sound and vision," according to a Space Adventures statement. "She remains among the world’s most prominent performers, with global sales of 30 million units having received more than 180 gold and platinum awards in over 40 countries." This year, Brightman is serving as a UNESCO "Artist For Peace" Ambassador, and is working on a new record to be released in late 2012.